After a near seven-month absence, popular Hall of Fame jockey Victor Espinoza, a winner of the 2015 Triple Crown with American Pharoah, will return to the saddle on Monday at Santa Anita, as he's been named to ride Irish-bred Gallantlystreaming in the first race for Hronis Racing, LLC and trainer John Sadler. 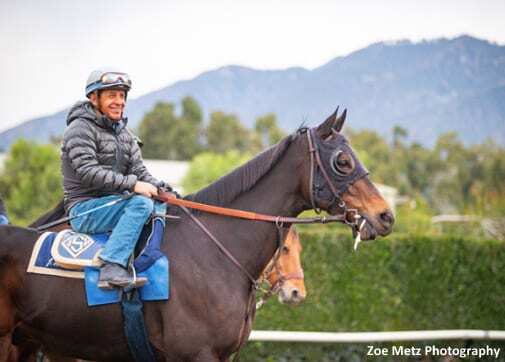 Sidelined due to a fractured vertebra in his neck which was sustained in a morning workout at Del Mar July 22, the road to recovery and return to the saddle has been a long and arduous journey for the 46-year-old Espinoza. “At first, I thought I was done, I really did,” said Espinoza, who initially lacked feeling in his left arm and required 24-hour assistance with life's basics, such as shaving, walking and getting in and out of bed. “At that point I was thinking this is it, that my health has to come first and I was thinking about 'What am I going to do with my life?' But about three months ago, it kind of happened overnight. I started feeling better and I felt like I could make it back. I'm ready. It's good for me to know that I'm 100 percent and I can come back now and do my job. A winner of three Kentucky Derbies, in 2002 with War Emblem, in 2014 with California Chrome and 2015 with American Pharoah, Espinoza, who declared himself “The luckiest Mexican on earth!” following his 2015 Belmont Stakes win, said that he and his agent, Brian Beach, are making themselves available to horsemen in the mornings here at Santa Anita. For his part, Beach is looking forward to sunny skies as he continues to plot Espinoza's comeback. “We've been wanting to work a lot of horses for different people, but we've been a victim of the inclement weather,” he said. “The track has been closed a lot in the morning so it's really limited us. At this point, I thought it would be better to get him named on a horse. A 4-year-old filly that's sprinted on turf in three maiden special weight races, Gallantlystreaming drew the far outside in a field of 10 fillies and mares entered for a maiden $50,000 claiming tag at 6 ½ furlongs down the hillside turf here on Monday. From milking cows on his family's farm, to driving a bus in his native Mexico City at age 17, to coming to America in 1990 with little money and no “Ingles,” Victor Espinoza has already overcome steep odds to succeed at racing's top levels. Here's hoping he'll be flashing his million dollar smile in the Santa Anita Winner's Circle soon. This entry was posted in NL Article, People and tagged american pharoah, brian beach, California Chrome, Del Mar, hronis racing, jockey fall, jockey injury, john sadler, santa anita, Victor Espinoza, war emblem by Mike Willman/Santa Anita. Bookmark the permalink.